Is an Adjacency Needed to Win in Team Collaboration? The communications business has changed dramatically over the last 15 or so years, as most No Jitter readers are well aware. The years have been hard on leaders from that era, with private equity deals, bankruptcies, and revenue declines making huge impacts on companies like Alcatel, Avaya, Mitel, NEC, and Nortel. At the same time, Cisco and Microsoft entered and thrived in the market -- and not just because of their business communications offerings, but also because of market adjacencies that have become increasingly relevant through the ongoing convergence of communications with information systems and applications. A market adjacency is when a company enters a market because that market has become linked to a separate market where that company had a leadership position. For example, at the end of the steam age of railroads, the leaders all tried to transition to the new diesel electric locomotive market. But GM and GE, with their leadership in the adjacent markets of engines and electric motors were able to leverage that adjacency into market dominance. The result is that the steam companies (Alco, Baldwin, etc.) all failed in the diesel market. When markets that are separate converge, there is a high probability that the convergence will cause disruption and consolidation of vendors. This happened first with Cisco and VoIP. When Cisco bought IP PBX vendor Selsius Systems in 1998 and entered the business communications market, its product features and capabilities were at best OK when compared to the market-dominant PBX platforms. However, Cisco had a major, potentially even unstoppable, advantage: its adjacency in data networking infrastructure. That adjacency manifested itself in multiple ways. From a technology market perspective, Cisco owned over 60% of the campus Ethernet switching and more than 80% of the WAN router markets, according to analyst reports at the time (Del-Oro, etc.). By delivering integrations between the VoIP system and the underlying data network, Cisco was able to create a buying preference from the network for the VoIP solution. The ability to say that you should buy your VoIP from the underlying network vendor to reduce configuration, operational, and management issues, was a major sales point. While Nortel had data network products as well, its relatively low share wasn't useful in the same way. Because the data network revenue typically accounted for double or more than PBX revenue, Cisco was able to have a larger sales and systems engineering team present in a typical account, generating a sales advantage in the VoIP migration. Also, within enterprises, because data networking and IT staff were generally aligned, the tendency was to push integration between the VoIP system and the Cisco data network. This often resulted in the internal organizational data leader taking on responsibility for infrastructure, including the VoIP system. This adjacency resulted in Cisco winning 60% of the transitions from an existing PBX vendor to a VoIP provider, as can be seen in their installed base share growth in North America to 30-35% of the market. While the percentage of VoIP was small in 2002, by 2008, the majority of vendor transitions involved VoIP deployments, and by 2012 the figure approached 100%, especially in the North American and European markets. As a result, and given a 5% annual market churn/transition (to understand churn in the telecom market, please read the "Killer Churn" chapter of my book, "Napkin Logic"), Cisco was effectively winning 3% installed base share each year. In North America, the combined installed Avaya and Nortel base, which had stood at 65% to 70% in 2000, has been reduced to 40% to 45%, with Cisco now holding 30% to 35% of the North American installed base. In the early 2000s, Microsoft decided that collaboration was a critical component to add to the market leading Office Personal Productivity Suite, starting with Microsoft Messenger. As the UC market emerged in 2006, Microsoft was well positioned to leverage its Office Suite with the communication and collaboration features. While including VoIP and PSTN access, UC platforms also brought together capabilities such as instant messaging, video, whiteboards, document and screen sharing, and unified messaging. While all useful tools, only knowledge workers had much use for them. To improve the UC experience, Microsoft could parlay its adjacency in productivity, with the Office suite, that knowledge workers use to manage their personal business processes (Outlook for email and calendars, Word, Excel, PowerPoint). This adjacency gave Microsoft a critical advantage in the migration to UC. From a technical perspective, Microsoft could treat UC as an integrated component of its personal productivity suite. As with Cisco, Microsoft enjoyed more than an 85% share of the personal productivity suite software market. In fact, according to a 2017 Spiceworks survey of IT departments in the U.S., Canada, and U.K., 82% of enterprises use the on-premises version of Microsoft Office. Further, 53% use the cloud version, Office 365, while roughly 17% are using some form of other productivity app (G-Suite, Apple I-work, etc.). This integration enabled direct ties from the apps to communications; for example, while a knowledge worker edited a document in Word, the presence status of a comment's author would display. The adjacency also comes into play with pricing and licensing. By combining the UC and VoIP elements into a bundled offering, starting with Lync and progressing to Skype for Business Online, Microsoft has been able to include those functionalities in Office 365 licenses. To get the same UC/collaboration capabilities from another vendor required spending additional money with that vendor without any reduction in the bundled price from Microsoft This bundling strategy, which has been so effective in consumer markets like we see with cable television/Internet access/telephone bundles, can be equally effective in the business market. The result of this bundling is shown in the results of the No Jitter survey, Skype for Business Adoption Trends 2016. Sixty percent of enterprises with more than 5,000 seats said they were deploying Skype for Business. 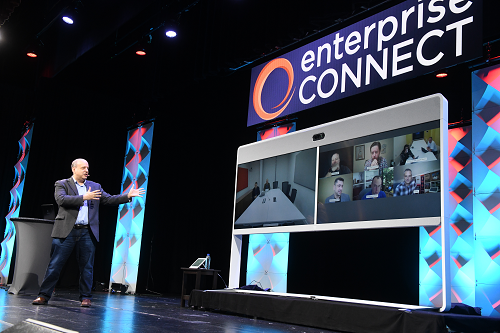 Microsoft is using the Office adjacency to build strong support, but the popularity of the Cisco versus Microsoft session I've co-presented at the last five Enterprise Connect conferences shows that many enterprises are still conflicted about what direction to go. Market disruptions can often rapidly transform the competitive balance -- and, as business consultant Clayton Christensen addresses in his book, "The Innovators Dilemma," a new technology can serve as a disruptive force. Market adjacencies are another form of disruption, delivering a key competitive advantage to a new entrant over existing competitors. Adjacencies to the team workspaces market will soon show their disruptive force. Just as with UC before it, adjacencies will impact the acquisition of team workspaces, as well as pricing, integration, and performance. In this new space, the adjacencies being used as the basis for developing a market attack strategy may have a similar impact. 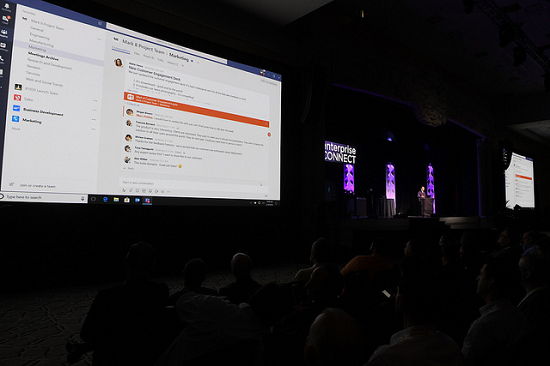 For example, at Enterprise Connect 2018, Facebook showed Workplace by Facebook, a team workspace modeled after the familiar consumer experience, for ease of adoption. Facebook emphasized this ease of adoption as a critical factor in its move from the consumer market into the adjacent enterprise market. Similarly, Amazon presented how its voice-controlled Alexa for Business digital assistant and Chime, its team workspace, provide logical business value. And IBM showed the value in the adjacency between Watson Workspace, its team workspace offering, and the rest of its portfolio, especially the Watson AI platform of which it sits on top. The connection to the vertical-specific solutions that IBM offers through Global Business Services is another clear adjacency. Of course, Microsoft has adjacencies for Teams, both in the personal productivity suite that knowledge worker team adoptees will be using, but also in the Azure cloud and integration business processes solutions the company delivers. And, of course, Cisco has the data network and VoIP solution adjacency to build on for its team collaboration offering, Spark. While adjacencies have helped and can continue to help a vendor in entering a market, they can also prove to be a negative. Since EC18, the issues surrounding the 2016 U.S. election have become a major challenge for Facebook. While the strength of 2 billion users may carry the company through the stormy weather on the consumer side, the privacy issues and national attention may be a negative factor in the company's efforts to grow into the business market -- essentially a negative adjacency. While only one major new competitor each fueled the VoIP and UC adjacency disruptions, in team workspaces, there are at least three players (or four, if Amazon is included). This is because team workspaces are much more than the next business communications solution; team workspaces have the potential to deliver micro business process automation through the team paradigm. The focus across the industry is making it clear that this is not only a major disruption to business communications, but potentially other adjacencies as well, including the contact center and more traditional business process software. As our industry moves into the new paradigm of team collaboration, it's increasingly clear that adjacency disruption is going to have a major impact on the structure of the industry over the next five to seven years. And this may be the wildest ride yet.